Moved to a new house, lots to do. But a big basement with lots of room for hobbies, reloading and shooting accessories are suddenly no problem! This entry was posted in Hunting, IPSC, Reloading, Shooting on May 8, 2015 by Magnus. 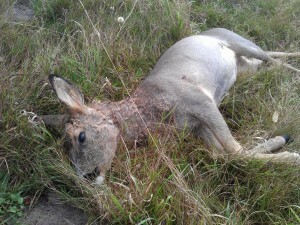 I shoot a roedeer in the fall, pürsched in to around 45 meters and got it with a lung/heart shoot from my .357Mag Marlin. That isn’t the important part of the story. The important part is that we then made “pulled roedeer” in that was marvelous! This entry was posted in Hunting, Reloading, Shooting on January 29, 2014 by Magnus.